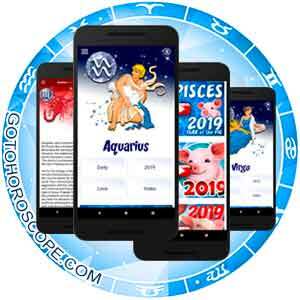 Daily Horoscope Apps for 12 Zodiac signs, 2019 Horoscope for the year of the Pig, and other free Apps for your mobile device. Horoscope for today, Daily Horoscope mobile Apps, and other applications from GotoHoroscope.com for installation on a mobile phone or tablet. In today's world, we are well accustomed to mobile phones, tablets, and gadgets! With the help of these mobile devices, people can check their email, get news and, of course, read their horoscope anytime and anywhere. This is undoubtedly one of the most convenient ways to get your daily astrological forecasts, especially with the installation of the horoscope mobile app for your Zodiac sign on your mobile phone or other Android or iOS device. GotoHoroscope.com goes with the times. On our site, you can find mobile applications that fit your zodiac sign. Using this new format of information delivery, we try not only to copy horoscopes from the site but also to give our dear users the opportunity to use all the advantages of mobile applications. For example, by setting our horoscope, you will be able to communicate directly with other users through the comment system and get access to wallpapers and screensavers for your mobile device, including images of the symbol of the year and your zodiac constellation. In addition to your daily horoscope, you will find dream interpretations, conspiracies and love spells, and annual forecasts for the current year. This section contains applications for all 12 zodiac signs. Select the application that matches your sign and install on your mobile device using Google Play or the App Store, and the Daily Horoscope will always be at your fingertips. The horoscope app for 2019 will reveal to you all the secrets that hide in plain sight during the year of the pig. This application provides the visual and sound accompaniment of your horoscope as well. Read your 2019 horoscope, leave feedback, and celebrate the year with us!